LastBit Act! 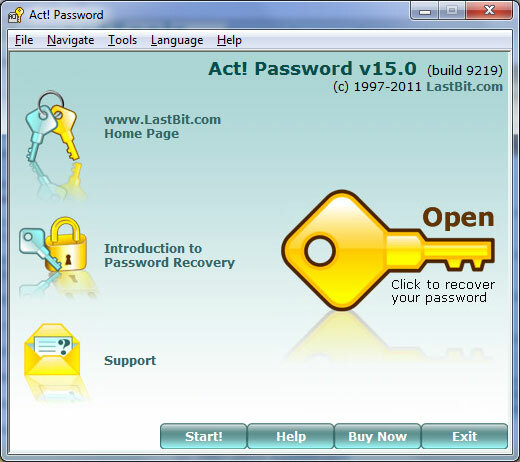 Password Recovery - Password recovery tool for Act! databases. Password recovery tool, which comes in very handy if you forgot, lost, or misplaced your password for Act! documents. Such situation may also occur if someone who does not work with you anymore password protects your vital information that is absolutely necessary to retrieve. The database structure was significantly changed in recent Act! versions. Old Act! versions keep all user and password information in a file of .blb file type. It is possible to extract user names and passwords instantly in old Act! versions. In the new Act! version SQL database is used. Passwords are no longer stored in the database, so there is no way to extract them instantly. Brute Force Attack or Dictionary Search are required to find original password. This may take a lot of time. Fortunately it is possible to reset the password to a known one instantly. However the original password will remain unknown. Program interface is web-like and easy to use. No professional expertise is required for setting up and using the program; in automatic mode you can recover any document just in few mouse clicks. The new version of Act! Password supports all Act! versions including the newest one (Act! 2008). The new improved password recovery engine is optimized for multi core CPUs and allows to achieve the best possible performance.